Painter, illustrator, comic strip artist. 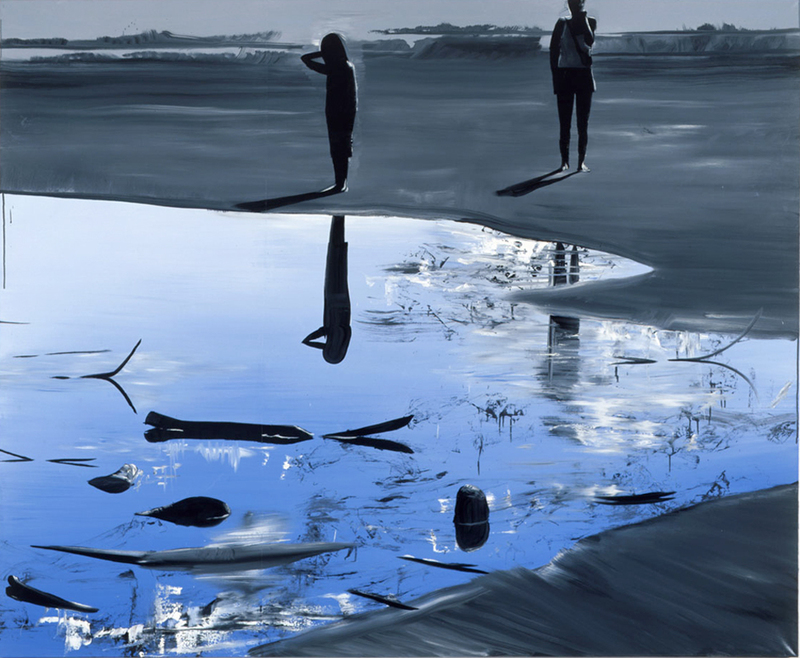 Wilhelm Sasnal's works are inspired by everyday life and the mass media. He interprets reality in a personal and often private way, creating expressive images which leave lasting impressions. His painting and films are a varied and free play on styles, modes of representation, techniques and means which always remain true to a traditional base, like oil on canvas for his paintings and the movie camera for his films. A strong sense of history and personal memory emerges from his painting which cross over and blend in his works. 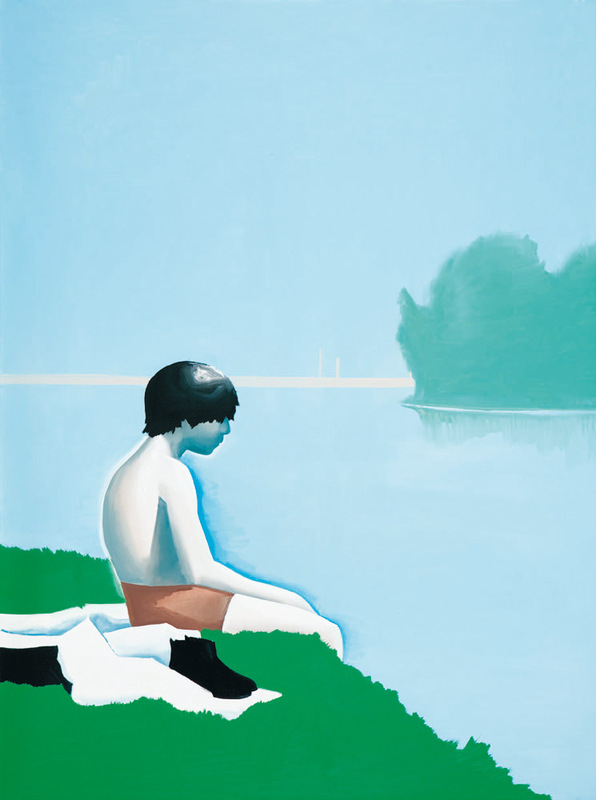 Considered by many critics a leading painter of his generation, Wilhelm Sasnal underlines the personal attachment and emotional relationship he has to the themes of his works, all chosen on the basis of attentive observation of his surroundings.The essential issues that continue to interest him are the limits and possibilities of representation and the examining of the process of seeing and perceiving. This explains the enormous stylistic variety of his art. Sasnal's paintings from the period of the Ładnie Group (till 2001) were described as pop-banalism. By painting banal objects, which automatically become distinguishable and perceived as signs of time, Sasnal became the author of a kind of chronicle of contemporaneity. Finally he began intertwining filmmaking with drawing and preparing iconographic materials. The artist has referred to himself on some occasion as a "realist painter", due to the fact that everything he creates originates from personal experience, communication media, images taken from books or via Internet, music... and definitely, events from his own life. This is what is most important to him. He tries to base his work on something real-life situations and objects. Inspired by everyday life and the mass media, Sasnal interprets reality in a personal and often private way, creating expressive images which leave lasting impressions. His painting and films are a varied and free play on styles, modes of representation, techniques and means which always remain true to a traditional base, like oil on canvas for his paintings and the movie camera for his films. A strong sense of history and personal memory emerges from his painting which cross over and blend in his works. 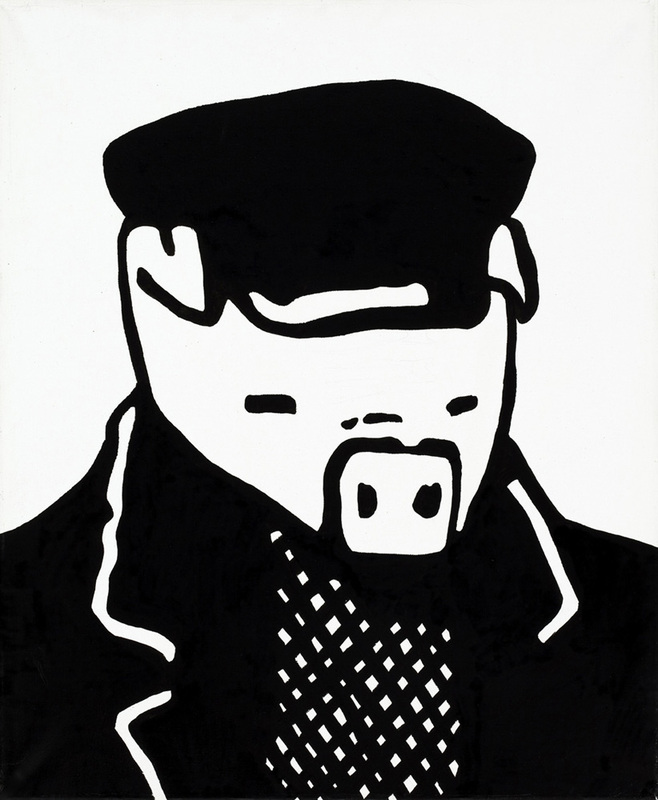 Sasnal’s early paintings depict various objects-props, common for the aesthetic experience of his generation, such as, for example, record and comic book covers, favourite-band T-shirts, cars, bicycles. He eagerly uses synthetic cuts, reduces painted shapes to simple, graphic signs, captures images on canvas like film-stills. His art alludes to important historical or political events (for example, the imprisonment of Pinochet), often episodes of Polish history or Polish national identity (Wyszyński, Narutowicz, Partyzanci, Kielce-Kraków). It refers to spectacular catastrophes described in the mass media (the sinking of the Kursk, the Concorde catastrophe) as well as contemporary art (for example a painting by Jerzy Nowosielski). He often draws his inspiration from a single detail, events from private and social life (Patricia Ceased Eating Meat, Anka Does not Vote) and scenes from holidays with his wife at the sea side. His artistic practice is discursive and by containing quotes, referring to mass media culture, his work triggers the observer’s memory. "My mind is incapable of producing fiction. I always try to draw on things that already exist" he clarifies. Apart from painting and drawing comics, he makes films. These are, among others, clips to his favourite music, recordings of the passing of spare time or, as was the case of the film Samochody i ludzie (Cars and People) from 2001, car accidents. In this work that draws upon the mediated character of catastrophes, Sasnal used toys, soldier figures and toy cars, under which he placed petards and then filmed the accidents staged in this way. The final film material was presented later in a great close-up, which on the one hand, gave a very realistic effect, on the other, however, changed the exploding cars into objects of aesthetic contemplation. Wilhelm Sasnal studied architecture at the Kraków University of Technology in 1992-1994, and in 1994-1999 painting at the Academy of Fine Arts in Kraków (diploma under prof. Leszek Misiak). In 1999 he received the Grand Prix at the Painitng Biennial Bielska Jesień and in 2003 - the Pegaz prize for art. Around 2001, Sasnal began to intensively expand his stylistic and formal means of expression. Once he separted from the Ładnie Group, he would come to describe himself as an ‘engaged artist’. For the Popelite exhibition at Kraków Bunkier Sztuki Gallery and an individual show at the Raster Gallery, Sasnal published a comic book entitled Życie codzienne w Polsce (Everyday Life in Poland). It depicts two years from the life of the artist and his wife Anka: of the birth of his son Kacper, the stay of his wife at the hospital, of buying a car, painting and refurbishing a flat, of exhibitions, awards, listening to the Radiostacja, all presented in the form of a comic strip. The book was announced the first truly realistic work on the generation of people born in the 70s. 2002 was a significant year in Sasnal’s artistic development. His exhibition at the Art Basel International Art Show was followed by invitations to take part in international art exhibitions: Urgent Painting, Painting on the Move. He was offered to present his works in the Kunstverein in Münster, in Cologne and the Kunsthalle in Zürich where he first presented his films alongside his paintings. His rising popularity directly influenced the rising value of his paintings. His works illustrated the covers of Artforum and Frieze. Some of his new work that year included eliminating the drawings of a fragment of Maus, a comic book by Art Spiegelman, leaving only texts referring to the war experience of the Jews of Bielsko painted on the wall of Bielska BWA Gallery; a landscape inspired by a fragment of Tadeusz Borowski's story and by a series of modernist churches in Tarnów painted upside down; paintings based on Alexandr Rodchenko's photographs juxtaposed with painterly variations on the adventures of a fable's protagonist – Bromba. In the beginning of 2003, Sasnal was invited to prepare an individual presentation at the Anton Kerk Gallery in New York, where he exhibited abstract, out of focus paintings, paintings-objects made with the use of paint squeezed out of a tube straight onto canvas, texture paintings made with fingers, works made of various pieces of paintings connected together, and canvas hung loosely on stretchers, just like curtains. In 2010 he returned to the New York Gallery for a second solo show, this time taking up a more personal subject - images of his wife, his son, friends complement views of the night sky, the vast ocean, painted in broad uninterrupted fields of color generously spread across the canvas. The figures are standing still, looking intently at the scene before them, an industrial landscape here, a large pool of teal-blue water there. Or they recline, under a tree, on the beach, in bed. But these are not moments of leisure, but rather of contemplation and thoughtfulness, of hushed conversations, of silence or dreamlike muteness. As in the painting of a boy calling out to the viewer who - standing at he painter's vantage point, namely far out in the ocean - is unable to hear his voice. His voicelessness dominates the painting in the form of a large biomorphic white shape that seems to trigger modernist memories in the viewer. In 2003 he made a film from the material registered during one of the last flights of the Concorde, presenting a view from a window of the supersonic jet. The film was screened on the exhibition entitled Ukryte w słońcu (Hidden in the Daylight) in Cieszyn with the use of a projector especially prepared for this presentation, which was destroying the film tape while screening the film. In 2004, Sasnal made a series of abstract, almost psychodelic drawings based on the comic books of Tytus, Romek and A'Tomek, popular among Polish children across generations. In 2005 his works featured in the Charles Saatchi Triumph of Painting exhibition. The painting Samoloty (Airplanes, 1999) from the Saatchi collection was sold for 396 thousand dollars at New York’s Christie’s – the largest sum of money ever to be paid for a contemporary polish oil painting. The same year he created the series Mościce I and II, canvasses made from black and white photographs showing the development of the chemical industry in his Home Town Tarnów. Similarly to the series of Chicago works from the same year, this work alludes to the demise of a modern utopia, but veers towards the abstract. "Z daleka widok jest piękny" - zwiastun from Culture.pl on Vimeo. 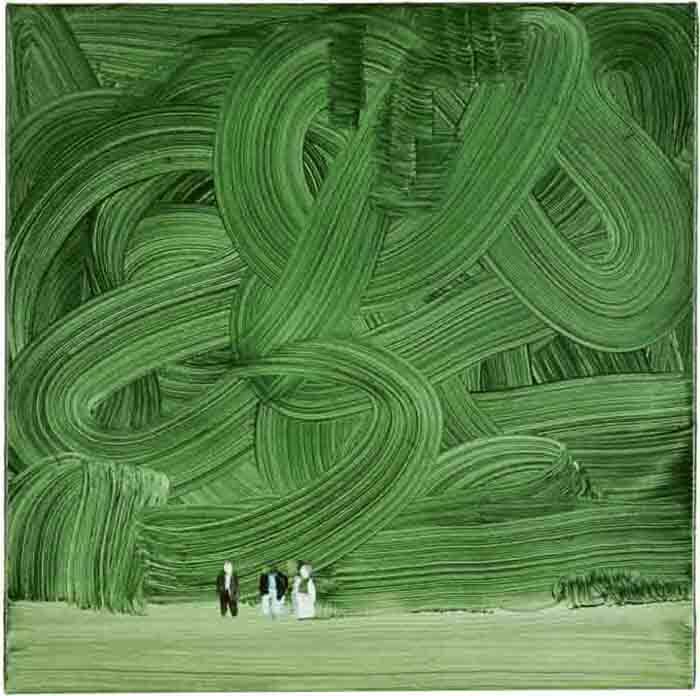 In 2006 Wilhelm Sasnal came first in Flash Art’s ranking of the world’s 100 best young artists. The same year he received theVincent van Gogh Biennial Award for Contemporary Art in Europe and exhibited his films (The River, Camera and Kodachrom). Sasnal began making films on a 8 mm camera. At the America exhibition in Warsaw he presented three films created a year earlier during his stay in Texas: Marfa, The River and Mojave. Marfa is an account of his stay in the Texan town and features everyone he had met in Marfa including a local anarchist musical group. The River is a musical film, showing different bands singing Texas from The River, a book about Mississipi. Mojave was filmed in the Californian desert and portrays a woman and a boy wandering among rusting airplane wrecks accompanied by music from Polish movies from the 50ties. His interest in old Polish movies is also visible in Let Me Tell You presented at the Anton Kern Gallery in New York in 2007. The artist used scenes from the fictional film Historia współczesna Wandy Jakubowskiej (A modern telling of Wanda Jakubowska’s story) from 1960. In 2009 the Kunstsammlung Nordrhein-Westfalen in Düsseldorf hosted a solo show of 80 of his works, mostly paintings based on either found or self-made photographs that refer to an unconcluded postwar era - a consciousness that forms the subtle substrate of many images. The presentation was configured freely around the classical themes of portrait, landscape, stilllife, genre, and history painting, thereby exploring the larger historical context of his art. In 2010 the Center for Contemporary Art in Malaga (CAC) presented the first large-scale solo exhibition of Wilhelm Sasnal's works in Spain. At the opening, Fernando Francés, director of the The Centre for Contemporary Art in Malaga, stated that the exhibition uncovers the work of an artist that makes a subjective and intimate interpretation of the world around him. His paintings are loaded with intellectuality and disguise the great complexity of an underlying story, despite being works that originate from daily life. Perhaps this is the reason that he manages to establish direct communication with the spectator, since the motifs he captures in his work are easily recognisable to everyone, they are part of our lives. In 2011 the Whitechapel Gallery in London hosted a 10-week show of over 60 of paintings of the last decade, presenting the diverse range of subjects and techniques taken up by the artist. The paintings ranged in subject from portraits of his family and friends to the inside of his eye lid, from photographs taken on his world travels to images of the troubling chapters in the history of Poland including World War II and the Holocaust. The show referenced world events and the artist’s extensive travels before returning to Pop-inspired work from the 1990s and reflections on the troubled history of his native Poland. The cross-over between film, video, photography and painting which forms the focus of the third part of the exhibition is complemented by a selection of Sasnal’s acclaimed shorts and feature films screened as part of the accompanying events programme. The show demonstrated the artist's painterly technique of fusing Romanticism with cool Realism and ironic Pop as he overrides traditional distinctions between abstract and figurative art, creating such paintings as an impression of Georges Seurat's impressionist Bathers at Asnières and Art Spiegelman’s comic-style narration of the Holocaust serves as pretext for a series of stark black-and-white paintings. In the weekend edition of The Guardian (16.10.2011), reviewer Rachel Cooke questions how "good a painter he actually is". However, she does acknowledge the strength of Sasnal's message, remarking that he has "has big things to say about politics, faith and community". There wasn’t a special moment I changed the way I work, so I see the whole process as an evolution. During the last 10 years of my practice, I see probably a couple of periods, but they are not properly divided for me. For sure there was a moment after finishing study that I was afraid of painting in pastel. I tried to draw rather than paint - to draw with the oil on canvas. At that time I didn’t attend museums, I didn’t want to look at old masters and probably it took me 2-3 years until I felt free of this hang-up, this post-school hangover. I was also fed up and tired of being labelled as a pop artist someone who used this pop language or pop reality. In her review Cooke goes on to describe Sasnal's work at the current solo exhibition at the Whitechapel Gallery as "both fascinating and bleak, the weight of 20th-century history bearing down on every wall of every room" and favourably compares his work to that of Gerard Richter (whose works are also on show in London, at the Tate Modern). Cooke indicates a preference for Sasnal's later works, weighing the burdensome legacy of communism and post-Holocaust angst that continue to haunt Polish society. I wanted to put myself in a confrontational position to face it, to face what was also controversial for myself. I didn’t like it. I didn’t want to hear that I came from the nation that was not only a victim. That was painful and difficult for me. What I painted was reaction. In 2011 he produced a short film together with his wife Anka Sasnal, which began making the rounds of festivals and other venues, including the Museum of Modern Art in New York and the International Film Festival in Rotterdam. It Looks Better From a Distance is an artistic experiment with traditional forms of narrative and dialogue, drawing mainly from a strong visual pace. The village portrayed in the film is home to a dozen families. The world they live in is condensed and small, yet all areas of life are properly prioritised and kept in a quietly guarded order. The film tells the story of villagers whose lives unfold in safe monotony and repetition, and yet, beneath the surface, a sharp alertness is preserved. This hidden reactivity turns their attention to any signs of otherness they encounter and allows them to profit from any opportunity. A covert and unpredictable lust seems to run the course of their lives. In the film, the heat itself drives everybody in the village to their wit’s ends, making them balance a thin line between rage and a lifeless stasis. Aggression and hatred on one hand, and fears, longings and emotional crises on the other are constantly about to break through a seemingly indifferent and still surface. In May 2012 he presented a new series of works, once again taking on the intimate them of home and family, at the Foksal Foundation Gallery in Warsaw. In February 2013 he had his fifth solo show at the Anton Kern Gallery in New York, presenting works played on the idea of the "Kodak moment" and the culture of capturing an evanescent point in time which, in turn, endows it with an additional significance for those who have a connection with the particular situation or event. He takes into consideration the material nature of film and its potential to transform an image, as well as the symbolism and subconscious qualities of the act of picture-taking and the meanings within the resulting image. The works in the show range from quite literal depictions of a box of film to more subjective images of "Kodak moments". Author: Ewa Gorzadek, Centre for Contemporary Art Ujazdowski Castle, April 2004. Updated and edited by Agnieszka Le Nart and Marta Jazowska, April 2012.